The Ottawa Township High School (OTHS) ChemClub, from Ottawa, IL, participated in the largest ever SciFest at Illinois Valley Community College (IVCC) held on Friday, April 29. 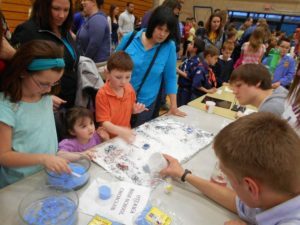 Other SciFest participants included Triton College ChemClub, IVCC ChemClub and STEM club, Exelon Nuclear, Carus Chemical, ACS, and a number of others led the over 600 attendees through numerous activities and demonstrations. The OTHS ChemClub took instant snow, heat sensitive LCD paper, made baking soda rockets, eggs that had their shells removed by soaking in vinegar and highlighter (still raw, kind of messy when they broke), and gave away T shirts with a T-shirt cannon. The one labeled Jelly is our VP Angelica “Jelly” Briones laying on a bed of nails. 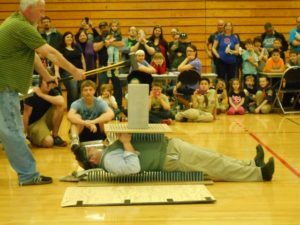 Dr. Johll was finally was able to crush the 55 gallon drum using air pressure!